i finished the socks i started on boxing day on sunday, so just under a month, even with a fair bit of dedicated knitting time. 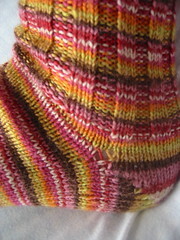 i used wendy’s toe up sock pattern which was (on the whole) a breeze. once i got my head around the short rows it was really straightforward - enough to manage the second one with barely a glance at the pattern. the biggest problem i had was knitting the double wraps at the ends of the rows in properly to make the right side neat. trouble is i don’t remember how i managed to do it right in the end, or even where i found the tip that set me on the right path. i know that knittinghelp didn’t help me this time. next time i do some i’ll have to update this entry, when it all comes back to me or i have to go hunting for help again. since it’s my first try at socks they don’t fit brilliantly and don’t match. the first one (on the right in the pic) turned out so much too small around the leg that i cast the second on with extra stitches (64 vs 60) and accidentally started the ribbing much lower on the leg. so i decided to frog the first back to the ankle so that i could increase the number of stitches in the cuff. 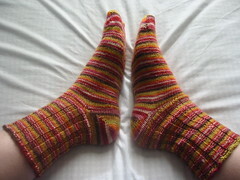 so i actually had 2 nearly completed socks about 2 weeks ago, but it took me a while to get back to finishing sock no.1. the final verdict is that sock no.1 istoo small - it’s a little short in the foot and it could be a little wider. sock 2 was too long in the foot before a wash but perhaps fits about right now. i actually decreased the sitches by 2 once i’d past the ball of my foot as it was feeling a little loose (it turned out that my tension relaxed loads after i’d firmly got the hang of the dpns - the first sock bore very little resemblance to my guage swatch, much tighter) then i increased up to 66 for the cuff. on the first sock i changed from 2.5 to 2mm dpns for the 3x3 ribbing but had to change back since one of my birch needles snapped (i didn’t put any additional pressure on it). i limped along with 4 until i lost another irretrievably down the back of the in-laws sofa, and then reverted to the 2.5s. i have to say i much preferred working with the metal needles, but will have to remember to test the replacement guarantee on the brittany ones. i think next time i would do the rib in a smaller size needle, but increase the stitches to compensate - i think i’d prefer a tighter looking rib. while i love the striped yarn (regia canadian colors, toronto) in the stockinette stretches i’m not mad on it in the rib, the purl stitches are too bittily stripey. i guess i’d be better off with a wider stripe. i had problems when it came to binding off, too tight, but solved that with a crochet cast off that i’ll link to here cos i’m sure i’ll come looking for it again soon. i did have a very slight widening at the corner of the needles but a trip through the wash evened them out a treat.